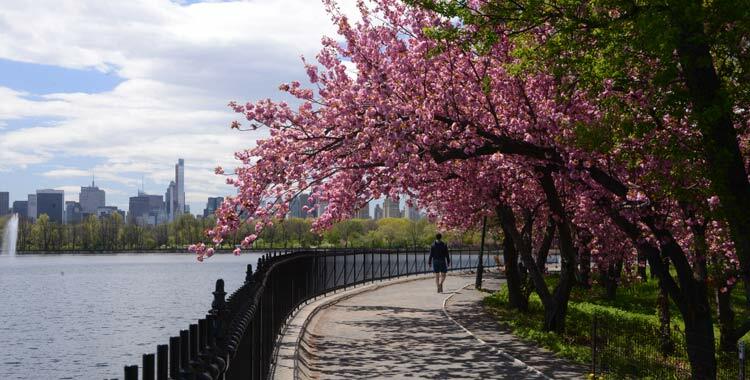 Featuring an unsurpassed view of nearly 100 acres of water and the Manhattan skyline, this 1.58-mile track loops around the Reservoir and is one of the most popular running destinations in the world. It wasn't always this popular, nor this beautiful. Until 2003, the view of the Reservoir and cityscape were obscured by a seven-foot-high chain-link fence. Central Park Conservancy restored the original fence after scuba divers discovered a piece of it in the Reservoir, commissioning a steel replica with cast-iron ornamentation. At just four feet high, the new fence opened up the view and now offers runners an unparalleled experience. The running track spans almost the entire width of the Park, and reaches from 86th Street to 96th Street. The track is a designated walking and running area. For your safety and for the safety of others, please walk or run in a counter-clockwise direction, and use caution when taking photos. Note: Dogs, bicycles, and baby carriages/strollers are not permitted on the Reservoir Running Track. Central Park Conservancy reopened the Reservoir running track on May 27, 2015 after completing extensive renovations. The track has been re-named the Stephanie and Fred Shuman Running Track in recognition of a generous donation by the Shumans, who provided significant funding for the renovation project as well as critical long-term maintenance of the site. The Conservancy is also grateful to the many other friends and neighbors who helped make this project possible, especially The Goldie Anna Charitable Trust and The William & Dewey Edelman Charitable Trust for their leadership support. Around the Reservoir 85th Street to 96th Street, from east to west.